For those interested at all in mammoths, you probably know about them going extinct. Some of you will also know that a very few mammoths managed to survive the immediate, main extinction, managing to make it until about 4,000 years ago before the last one bit the bullet. In my curiosity, I frequent several blogs. On more than one, every time the subject comes up about the mammoth population going extinct at the onset of the Younger Dryas cold period 12,800 years ago, some bloke brings up the facts of these small island populations of mammoths, the last group of which survived until more or less 4,000 years ago. They are correct about those mammoths surviving. But are they right about that not being an extinction event at 12,800 years ago? Dead clade walking also known as “survival without recovery” refers to a clade (group) of organisms which survived a mass extinction but never recovered in numbers, becoming extinct a few million years after the mass extinction or failed to recover in numbers and diversity. Now, I first heard of Dead Clade Walking on the TV show Elementary, a Sherlock Holmes in modern day New York City series. I had not heard of the term when Holmes used it. He actually DID explain what it meant to Dr. Watson, and when he did, that piqued my interest. That Clovis Overkill Hypothesis? How much evidence is there for it, really? 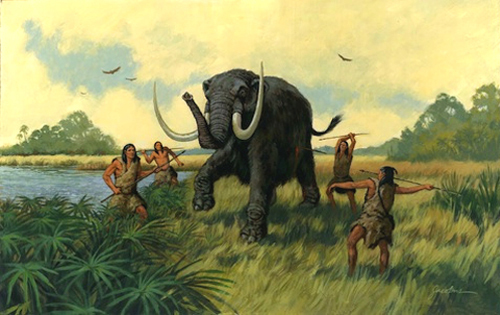 I am amazed that this Clovis as mammoth murderer to extinction idea still has traction. See “A requiem for North American overkill” Grayson and Meltzer 2003. (Yes, the very same Meltzer who is a co-author on some of the YDB skeptical papers.) All the quotes are from that paper. The argument that human hunters were responsible for the extinction of a wide variety of large Pleistocene mammals emerged in western Europe during the 1860s, alongside the recognition that people had coexisted with those mammals. Today, the overkill position is rejected for western Europe but lives on in Australia and North America. The survival of this hypothesis is due almost entirely to Paul Martin, the architect of the first detailed version of it. In North America, archaeologists and paleontologists whose work focuses on the late Pleistocene routinely reject Martin’s position for two prime reasons: there is virtually no evidence that supports it, and there is a remarkably broad set of evidence that strongly suggests that it is wrong. In response, Martin asserts that the overkill model predicts a lack of supporting evidence, thus turning the absence of empirical support into support for his beliefs. We suggest that this feature of the overkill position removes the hypothesis from the realm of science and places it squarely in the realm of faith. One may or may not believe in the overkill position, but one should not confuse it with a scientific hypothesis about the nature of the North American past. The initial human colonization of island after island was followed by vertebrate extinction. That this premise is true, however, does not mean that it is relevant to continental extinctions. After all, the factors that make islands prone to vertebrate extinction — small population sizes of resident vertebrates, the lack of a ready source of conspecific colonizers, and so on — do not apply to the continental setting. Only the ones in red have confirmed kill sites (number of sites). See Clovis hunting and large mammal extinction: a critical review of the evidence (Grayson and Meltzer 2002) . Also see How Many Elephant Kills are 14? Clovis and Mastodon Kills in Context (Surovell and Waguespack 2008). In my previous post, Mapping Clovis Man vs Mammoths – Just Asking, I’d asked about the apparent blind spot in Clovis-Mammoth studies. 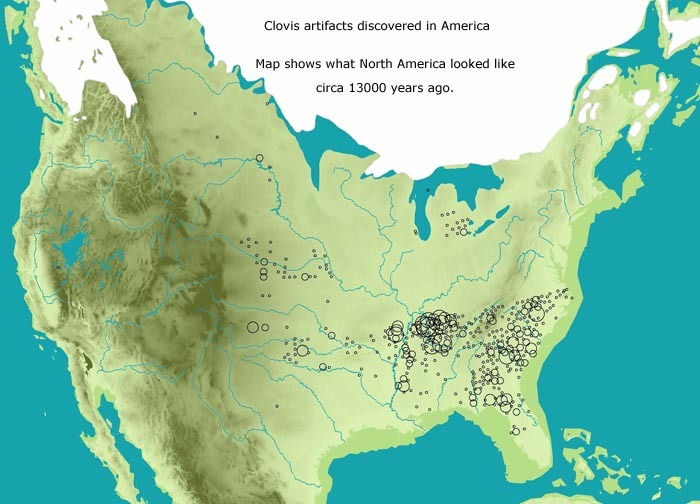 The maps there showed Clovis artifacts VERY predominantly in the Eastern USA, yet amazingly, the only “Clovis sites” chosen for study in Waguespack & Surovell 2003 were sites specifically showing mammoth kills. Using the most lenient and problematic standard of Proboscidean use, simple presence in zooarcheological assemblages, we previously estimated that at least 91 individual mammoths and mastodons are known from a total of 26 Clovis sites (Waguespack and Surovell, 2003, Table 2). Based on available data, no other taxon is present in as many sites or is represented by as many individuals.